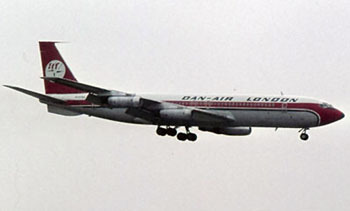 On May 14, 1977, a Boeing Model 707-300 series airplane, operated by Dan-Air, Ltd, crashed on approach to landing in Zambia, Africa. The accident occurred in daylight and in good weather. The horizontal stabilizer of the aircraft was found 200 meters away from the wreckage, indicating a separation of structure during flight. Investigation of the fractured stabilizer revealed that the failsafe characteristics of the structure did not perform as intended. Further investigation showed that design changes intended to statically strengthen the stabilizer structure, as part of the 707-300 design, also induced higher than expected fatigue loads and subsequent failure of the stabilizer structure.